My guess is that they didn’t want to preserve a 4 car set and figured that they would just preserve an R46 (my guess is that they will keep one of the 2 car sets). It’s also possible that the cars were so deteriorated that they didn’t want any more or that they couldn’t secure a set in time. Thing is, the 4665-4660 pair had some cosmetic work done to it a few years ago. A blue stripe was installed on the front of 4665 I believe and it was done to make the pair look pre-GOH like. Besides that, the pair doesn't seem to be looking too bad, as last I checked, I only saw minor rust on the roofs. In addition to 3350-3351 and the R40M-R42 pair, there are also two R16s (6305 and 6339) and one D-Type (6112) that are also preserved. The R32 is in excellent condition. With the two R16s, however, not too good. 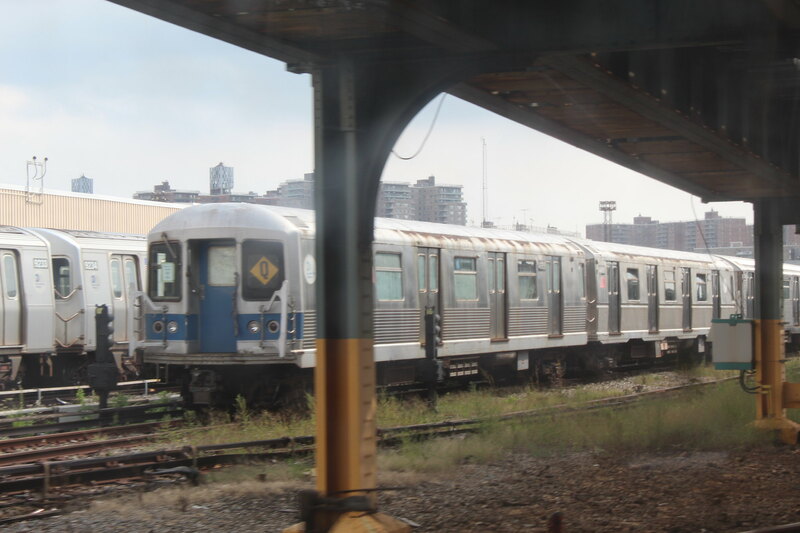 Although 6305 got a repaint into the blue/white MTA livery back in 2013, the paint has since chipped off. As for 6339, it's missing number plates with corrosion on the side. The D-Type (6112) is in good condition, and the reason why it's at Coney Island is because it had motor problems at the Parade of Trains last year. However, that set should be up and running soon.